Happy holidays, Dallas AFP members and friends! December 31 marks the end of my two years as president of Dallas AFP. I’d like to thank DAFP’s membership for giving me the opportunity to lead the organization. I’d like to thank former DAFP presidents Stacy Roth, Ray Vines and Christy Petty, from each of whom I have learned so much over the years, and who have continued to serve on the board after their presidencies. I’d like to thank all of the other members who supported me by serving on the board the past two years: incoming president Ron Trimmer, Kim Marceau, Matt Roush, Trae Lynne Atchsion, Samantha Bell, Joan Calhoun, Connor Cosgrove, Kari Ellis, Laurel Egan Kenny, Mario Millan, Salina Morrow and Eric Thibo. Thank you all! To that end, I will be leaving momentarily to make the trek to Denton, to join a colleague from the Dallas Fed who will be speaking there to TWU’s student member Accounting and Finance Society about her own career in finance, as a CPA and more recently with the Fed. I will join her as an opportunity to evangelize on behalf of DAFP, and, I hope, to make contacts with students who will one day be members of our organization. 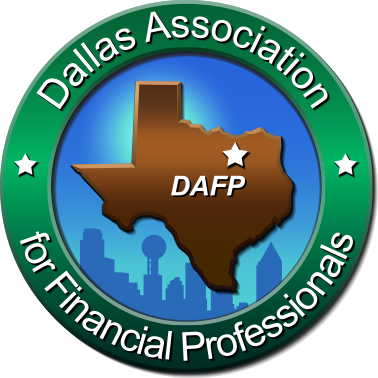 Please do your part to help Dallas AFP remain the “professional association of choice for individuals in Treasury and Financial careers in Dallas and surrounding areas…through Treasury Education, Relationship Building, Regional Collaboration and Community Development.” Renew your membership today for the 2019 year! And, tell a colleague or a client, bring a guest, or in some other way help to spread the good word about Dallas AFP! The Christmas season is here and the New Year is upon us! We hope you enjoyed your 2018 membership with the Dallas Association for Financial Professionals. Great things happened in 2018 including our organization hosting two record breaking attended events i.e., the regional TEXPO Conference which was held in Dallas and our very own BIG D Treasury and Financial Conference. Your attendance tells us that information is important and because it is constantly changing, professionals like you know where to go to stay in tune with the latest news and technology that affects your career. Renew your membership for 2019 to remain informed and on top of your game. DAFP provides you with information and connects you with people that will help you achieve your business and career objectives. To renew, go to our website at www.DallasAFP.org, click on Membership, Renew Membership. If you are joining, click on Membership, Join. If you have any questions about your membership or would like to be part of the membership committee, please contact us at membership@DallasAFP.org. Dallas AFP is dedicated to helping you succeed. Samantha B. and Eric T.
If you thought last year's event was over the top just wait until you see what we have in store for you this year. We are finalizing contracts and will be ready to share all the details with you mid December. Be on the lookout for an email that will include the registration link for you and your guest. Ernie Smith, CTP, FP&A, SVP North Texas Regional Sales Manager, BBVA Compass, celebrating 9 years at BBVA Compass.